A Puja is performed during Diwali in honor of Lord Ganesha and Goddess Lakshmi so that wealth, prosperity, and good health never leave us. Here is a painted pooja thali that would make your Diwali a colorful one for sure. 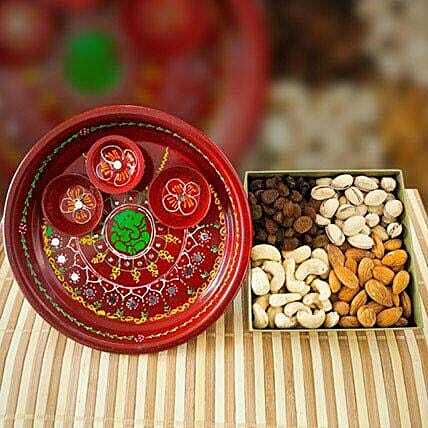 A box of mix dry fruits is also here to make this Diwali platter a tempting one. Room temperature is ideal for storing dry fruits. Do not store them in direct sunlight or near any heat source. Store them in a tightly sealed container.